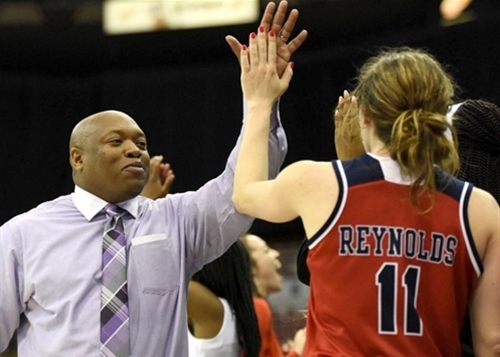 Coach Bernard Scott and stars Rosanna Reynolds (center) and Haleigh Ristovski after their victory. Motor City Madness had not been going the way of the local schools. 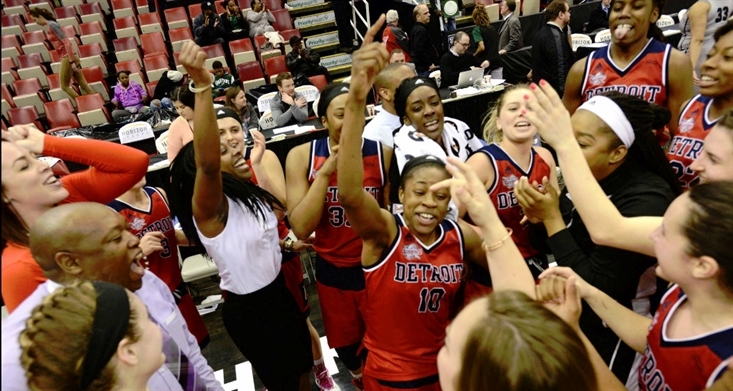 When the Horizon League men's and women's tournaments came to Joe Louis Arena, the hope was that a home crowd boost would propel Oakland and Detroit Mercy to big things. Then Bacari Alexander’s team was run out of the building by last-place Milwaukee. Greg Kampe’s Golden Grizzlies got their hearts broken at the buzzer by Youngstown State, also exiting quietly after just one game. Oakland’s women took the court the following afternoon and got drilled by 22. Three local teams, three losses and a bunch of disappointed Horizon League representatives. Crowds tend to swell when Michigan schools advance, so this string of results was not ideal. 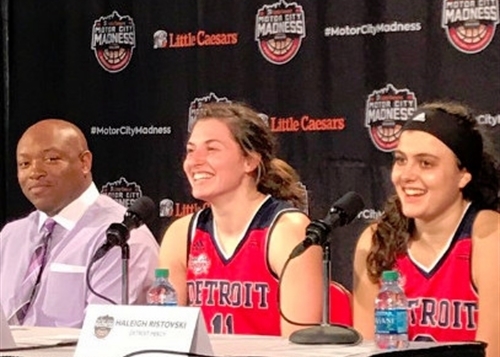 But on Monday afternoon, coach Bernard Scott and his hot-shooting ladies from Detroit Mercy came to the rescue, wrestling back some state pride for the mitten. On the strength of a superb all-around game from All-Horizon performer Rosanna Reynolds (Canton), the third-seeded Titans defeated Wright State, 71-52, advancing to the women’s championship game. They will take on perennial conference powerhouse Green Bay on Tuesday. "I probably won't sleep much [tonight] because I'll be excited about tomorrow," says Scott, whose passion-fueled coaching style suggests that he's never exactly been an eight-hour-a-night snoozer. The first 20 minutes contained one of the more statistically bizarre halves of basketball you will ever see. Wright State attempted 31 shots and made just five. Somehow they were still ahead by a point, 24-23. The key statistic could be found in the free throw column. Wright State was sent to the line 19 times; Detroit Mercy, once. The fact that Scott’s club trailed by just a point -- with such a severe disparity at the stripe -- was a minor miracle. But all year, this Titan team has kept up the pressure. There are few teams in the country, men or women, that compete as hard on every possession. Reynolds is the senior that makes the whole engine go. Wright State coach Katrina Merriweather called her "just a heck of a player." Her supporting cast, which includes a collection of snipers from 3-point land, found the big dimensions at Joe Louis perfectly to their liking. On the afternoon, Detroit Mercy cashed in 11 times from long range, while limiting the Wright State Raiders to just a single make. Nicole Urbanick and Anja Marinkovic each dropped in three from downtown. The Horizon League championship game is Tuesday at noon, airing on ESPNU. Forty more minutes of crisp basketball in front of what should be a heavily pro-Titan crowd and Scott could have his Detroit Mercy women dancing to the NCAA Tournament for the first time in 20 years.